This has been no brief scouting of the 24-year-old goalkeeper but virtually a 12-month trial since Eddie Howe brought him IN towards the end of the 2011/12 season and played him in the penultimate game of our Central League season against Tranmere. On a night when he had precious little action, in a game we won 3-1, he played in a team that contained just four players who remain with the club. Both Jack Errington and Alex Coleman were in the back four in front of him and in midfield the Clarets fielded both Steven Hewitt and Archie Love. Trialists come and go. Also in the team that night were Hednesford pair Cheyenne Dunkley and Chris Clements, Paul Jetta from Danish club Brøndby and Daniel Flores who made a late appearance as a substitute. When none of them appeared a few days later for the last game of the season it seemed a fair bet that it would be the last we'd see of any of them. 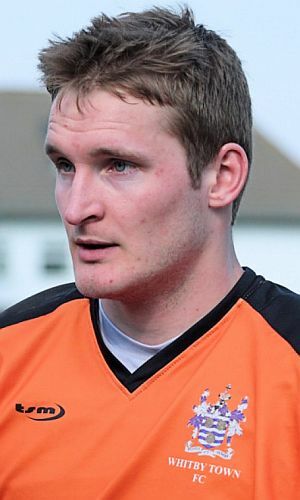 Goalkeeper Liversedge though had worked with our goalkeepers under the direction of goalkeeping coach Billy Mercer. Mercer was impressed with him and we kept the 6'4" stopper very much in mind, leading to him spending some considerable time at Burnley this season both during the time Howe remained as manager and then since Sean Dyche has taken over. His manager at Whitby, former Sunderland defender Darren Williams, said on his club's web site: "We've worked closely with Nick this year to help him and push him, as much as we could, to release him to play games for Burnley and to train there." Speaking to the Whitby Gazette, Williams added: "Nick has grown into himself, he's become a lot more confident this season. He has made some tremendous saves and kept clean sheets for us on many occasions. "When Nick initially came to us, his confidence had previously been knocked and he needed an opportunity, some guidance and encouragement. He's a quiet person and we needed him to come out of his shell. He's done that in the latter part of the season and all credit to him. "He has all the attributes and physical presence to be a very good keeper. If there's an opportunity for players to go out and progress, we are not a club who would stand in their way. We wish him all the best but the door is never closed." Williams also pointed out that they will receive no fee for Liversedge. "Unfortunately we don't reap the benefits, that's the disappointment," he added. "When players move on, especially to higher clubs, it'd be nice if we could get something, even if it's just a pre-season friendly." He also makes the move to Turf Moor with the best wishes of his captain at Whitby, Mark Robinson, who said: "I'm absolutely delighted for him. He's a top class keeper, works hard and I'm sure he'll do a great job." With the homework on Liversedge done over a year and more, he's expected to come in and support a new first choice goalkeeper. He's not the first to take the step up from non-league at that sort of age by any means. I was reminded this week of Peter Mellor who was 22 when he signed from Witton Albion and went straight into our first team, and locally, Clitheroe goalkeeper Carlo Nash moved to Crystal Palace at 23 and, now 39, is still in professional football with Stoke. Clarets Mad would wish to thank the Whitby Town photographer Brian Murfield and the Whitby Gazette for permission to use the attached photograph.